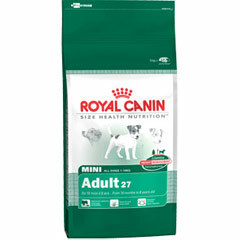 Royal Canin Size Health Mini Adult 4kg helps mini dogs to keep an ideal shape aged 10 months to 8 years. The special texture, shape and size of kibble, plus selected natural flavours and perfect preservation help satisfy fussy appetites. L-carnitine helps stimulate the metabolism of fat reserves. Sulphur amino-acids, omega 6 fatty acids and vitamin A help nourish the coat whilst Sodium polyphosphates help reduce the development of tartar.